Last weekend afforded me the opportunity to undertake another of my Indonesian politician style comparative study tours. 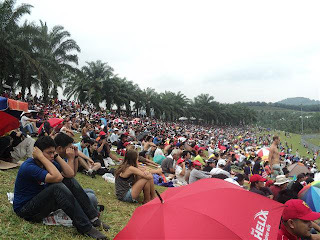 AirAsia once again supplied me with a great value flight and some simply appalling in-flight coffee, as I hopped over the briny to Kuala Lumpur in order to take in this year's Malaysian Grand Prix. 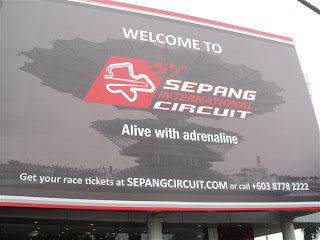 My trip to last year’s Singapore Grand Prix gave me a chance to compare the island state's sweeping boulevards and cyber-conformist hygiene with Jakarta’s pungently aromatic demographic implosion, and I was hoping that KL would offer up some similarly enlightening contrasts. KL has been described to me as being midway between Jakarta and Singapore, although the fact that both Malaysia and Singapore host Grands Prix, whilst Jakarta doesn't, perhaps tells you all that you need to know about the three cities' relative urban credentials. Indonesia's largest sporting event is the Commonwealth Masters Tennis tournament, which is held in Bali every year. This does indeed attract a few big names but it certainly isn't a big international event, although certain rogue tax officials have been so keen to attend in the past that they've been known to spring themselves from jail and don ludicrous Beatles wigs as a disguise. In any case, down at the AirAsia terminal of Kuala Lumpur International Airport, everything was a Formula 1 frenzy, presumably because AirAsia supremo and Malaysian mogul extraordinaire, Tony Fernandes, now owns his very own Formula 1 team (in fact, he's revived the iconic Lotus brand). An expensive hobby perhaps, but presumably Mr F. isn't short of a few ringgit. 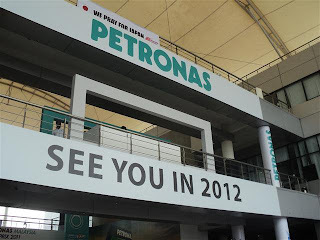 Kuala Lumpur's airport is roughly twice as far from the centre of town as Jakarta's Sukarno-Hatta is, however it lies a mere ten minute bus ride away from the Sepang Circuit. 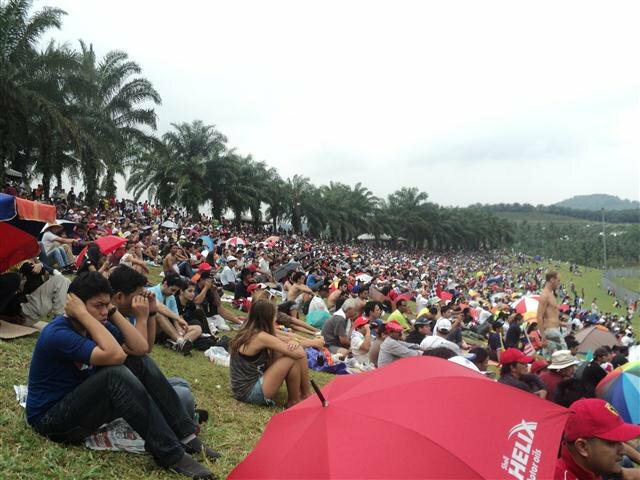 And so I soon found myself sitting on a lush, green hillside, necking Tiger beer and watching all of the Saturday qualifying action. 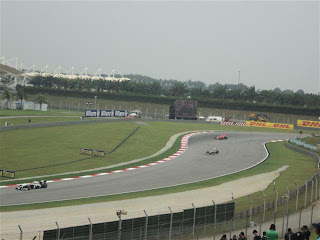 Sepang is a great place in fact and affords spectators some simply superb views of all those high-speed dogfights. After qualification was over, I had a stroll around the overpriced merchandise stalls (although there was a 50% discount on Michael Schumacher T-shirts -ha ha and furthermore, ha). 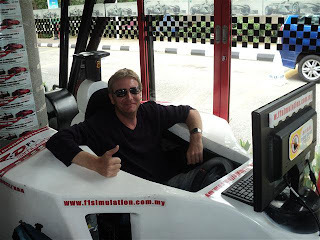 I then headed into KL Central to hook up with a couple of my F1 loving chums who had also made the hop over from the Big Durian for the race, and we all headed out for a little Saturday night fever. The centre of KL is perhaps closer in essence to Singapore than it is to Jakarta, and a few things stand out immediately to any visiting long-term Batavia warriors. Firstly, the traffic doesn't seem to be nearly as bad as the purgatorial gridlock that we all know and love. The lack of motorcycles in particular makes for a pleasant change. The second thing that struck me as we walked around KL is perhaps not entirely unrelated to the first. While Jakarta engages in endless debates about the city's actual and fantasized Gordian transportation knot of cars, busways, monorails, new flyovers and even bicycle lanes, the most fundamental mode of human transportation, namely Shanks's pony (or getting up of one's rear end and walking), has been sadly neglected. 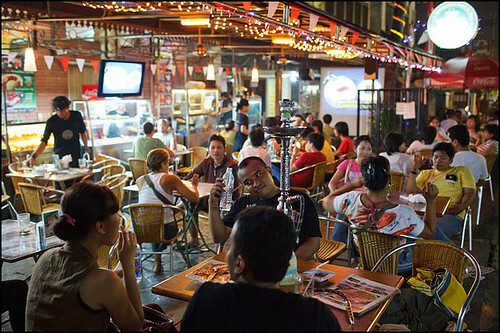 "Normal" developed urban environments usually feature those amazing technological innovations known as pavements and, as a knock-on effect, there are bustling streets filled with shops and the like. Jakarta's fancy shops are all safely buried within the closeted, safe, technocratic womb of the shopping mall, whilst outside a post-apocalyptic urban assault course of crumbling concrete, 30-year-old buses, raw sewage and underclass serfs serves to deter any integrated urban renaissance (although a few brave venues have now opted to try a more alfresco approach to city life). Coincidentally enough, I have just read that 500 trillion rupiah has been earmarked by the government for infrastructure development across the country. I reckon though that by the time a multitude of greedy politicos has dipped its avaricious mitts into the honeypot, there’ll be just about enough dough remaining for a couple of keep left signs. 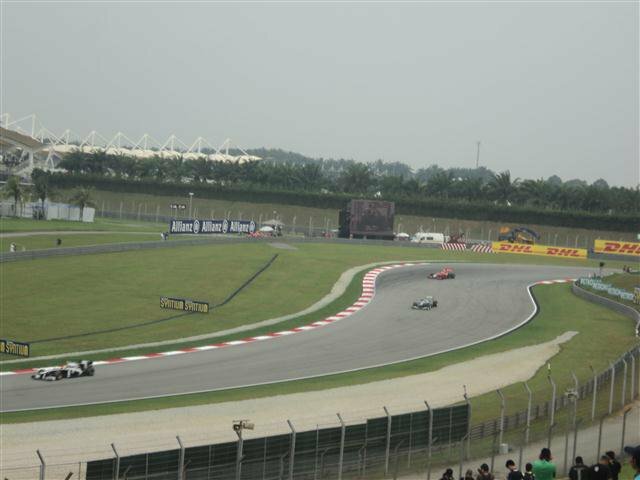 Meanwhile, back in KL, Sunday came around and we all headed back to Sepang for a highly enjoyable race that actually featured a fair amount of overtaking. Wonders will never cease. 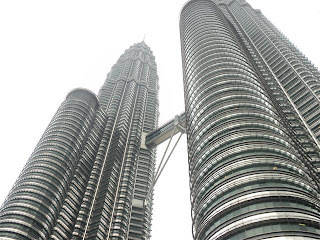 The next day, it was time to the inevitable lemming like tourist traipse around Kuala Lumpur Tower and the Petronas Twin Towers. As iconic as the Twin Towers have now become, they are basically just two large slabs of steel and concrete. Whatever happened to architectural creativity in our modern world? The entire thrust of modern architectural hubris seems to be to raise your non-idea of a building 15 storeys higher than the neighbouring country's non-idea of a building. Personally, I'd like to see Indonesia's putative and scandalously extravagant new parliamentary office building being constructed as a Gothic pastiche and filled with pointed arches and flying buttresses. Such a design would more fittingly reflect the mediaeval, Machiavellian mindset of those who will be ensconced inside it, enjoying a grease-down and a shiatsu whilst they scan the year's budget allocations to see what can be craftily diverted into their Citibank accounts. Gothic Jakarta, now that really would be infrastructure to be proud of. Last weekend, it was time for your intrepid hero to make another foray into Indonesia's bucolic boondocks with my obsessive-compulsive mountain climbing chum, Mr. Dan, and a few other curious takers fooled into parting with their hard earned cash by the slick graphics of Mr. Dan's Gunung Bagging website. Mr. Dan, in the flesh, has been known to exude the authority of a seasoned and knowledgeable hiker. On one occasion however, whilst leading a small group of keen and crisply booted, fresh-faced walkers on an early start through the Highlands of Bandung, Mr. Dan had felt a little worse for wear after a taxing night scaling Gunung Bintang and had ended up projectile chundering onto the road in front of his hiking disciples just before the off. This may have taken some of the lustre off the good Mr. Dan’s professional standing in the fiercely competitive world of amateur hiking, however it will take more than a mound of early-morning ale spew to put me off, and I soon found myself taking in the fresh air and outboard motor petrol fumes with Mr. Dan and the gang as our speedboat skimmed its way from Carita Beach on Java's west coast to the island of Panaintan, which sits next to the Ujung Kulon national park on Java southwestern tip. I do like to indulge in the occasional return to nature in order to remind myself of my own mortality. Such near terminally exhausting trips are always memorable and interesting, although 'fun' perhaps wouldn't be the right adjective to use. Alas though, I can't accompany that irrepressible bounder of adventure Mr. Dan quite as often as I’d like to, as sitting on my fat arse watching DVDs and eating chocolate makes a lot of pressing demands on my time you understand. Panaitan is the largest island in the Sunda Strait and is uninhabited by humans, save for a skeleton staff of caretakers. There's plenty of native fauna to be seen here however, including populations of deer, monkeys, pythons, monitor lizards, eagles, crabs, colourful fish, buffalo and even, apparently, crocodiles. I was slightly uneasy about the latter species to tell the truth. Animals are fascinating of course but I'm not an, "animal lover" as such, and rather regard those who lay claim to this title as perhaps compensating for a lack of more human bonhomie in their lives. The prospect of being chewed up by a bloody great crocodile should always inform one’s views of the natural world, lest one end up as dead as Australian naturalist and mental case Steve Irwin. Before last weekend's trip, I had, moreover, just watched a Werner Herzog documentary called, "Grizzly Man" in which another chuckle-brained individual, one Timothy Treadwell, attempts to befriend and live with a population of bears in the wilderness of Alaska, with predictable dietary consequences for the local ursine population. Personally, I doubted that a light spraying in Autan mosquito repellent would do much to deter a hungry croc from chowing down on my lily white legs, and I thus walked ashore at Panaitan with some trepidation. Thankfully though, while monkeys and deer could be spotted surrounding our campsite, crocodile-wise, things seemed peaceful and nature remained unbloodied in tooth and claw. After cooking up a spot of lunch it was time for the main event. We reboarded our boat and headed up the coast for 15 minutes for an assault on Gunung Raksa, Panaitan's main peak. Only 329m tall it may be, but our ascent of Raksa proved to be pretty much the most masochistic thing I've ever attempted. Next to this, the hike up the 4,000 m high Gunung Kinabalu in Malaysia that half killed me last year was a walk in the park. Dense jungle, steep, wet, muddy slopes and ludicrously inappropriate footwear conspired to have me looking as if I'd just crawled out of a particularly noxious swamp within a matter of minutes. Moreover, spring-loaded brambles liberally peppered with thorns gleefully grabbed at my hands and arms as I tried unsuccessfully for the 20th time not to fall over like a silent comedian on a banana skin. We eventually reached the summit, atop which sits the oldest statue in Java. Unfortunately however, it’s a statue of the Hindu deity Ganesha, which means that, in light of recent developments in Sumatra, "offended" Muslims will no doubt soon be campaigning for its removal, despite the fact that it stands in one of the most isolated spots in the whole country. Looking at the statue, I had a vision of fundamentalist types cursing as their virgin white robes turned to muddy brown and their beards got caught on brambles, while they attempted to scale Raksa in order to blow up the statue, and this immediately cheered me up. After a brief rain shower, which only served to make the muddy slopes even more slippery, it was time for the harrowing descent. I soon found myself bringing up the rear of our party of eight as I tried to negotiate the terrain carefully without breaking my neck. Alas though, this proved less than salutary place to be, as the seven infidels in front of me had worn the "path" down to the consistency of the slippery mud chute. After about 10 minutes of near fatal skids and tumbles, I gave up walking and opted to simply slide down the slopes on my behind, as if it were some kind of tropical luge run. This proved to be a just about workable technique, although I accelerated frighteningly out of control on a couple of occasions before slamming to a halt against tree trunks. Moreover, on the final 200m walk along the flat to our waiting boat, I tripped over a root and fell flat on my face. You really should leave Jakarta more often at the weekend folks, you don't know what you're missing. Well, Earth Hour came and went last weekend with many seemingly oblivious to its very existence. There are 8760 hours in a single year and thus cutting the power for one of these hours (punches numbers triumphantly into calculator) could result in a massive 0.0114 per cent reduction in our annual electricity consumption. Possibly this won't make a huge dent in global warming and the increasing likelihood that we’ll all be sipping Icelandic Shiraz before the century is out. Earth Hour is however, in the yoghurt-weaving, glibly eco parlance of our times, supposed to be more of a so-called "Consciousness raising" exercise. More of which later, for now though I'll just note that plenty of businesses around the city seemed to be using the event as an opportunity to promote their own agendas. "Come and enjoy Earth Hour with us by candlelight, there will be a 25 per cent discount on margaritas all night!" kind of thing. 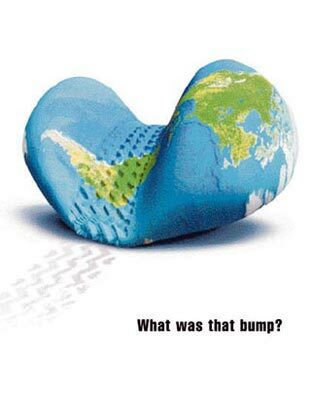 Rather cynical really, although perhaps the idea was to get the punters so drunk that they couldn't drive, thus reducing their carbon footprints to zero at a stroke. For my part, I decided to get on my bicycle and join an Earth Hour ride from fX Plaza up Jl. Sudirman to Monas with some of the city's keen amateur cyclists. As I'm sure most of you have noticed, there's something of a cycling revolution going on around town just at the moment. Young chaps have taken to twiddling around the city on the latest must have fashion accessory, namely the so-called ‘fixie’ bicycle. These are basically track bikes without gears and, quite worryingly, often without brakes too. Hipster kids are snapping up these rather impractical aluminium steeds like hot cakes however, usually in rather effeminate shades of lilac and turquoise and the like. They then spend their evenings pedalling between Circle K and 7Eleven in search of Red Bull fuelled good times (usually at extremely slow speeds due to the aforementioned lack of stopping power). And so my cycling brethren and I twiddled our way gently up the traffic choked Jl. Sudirman, possibly looking as incongruous as someone bouncing a pogo stick around a Formula One track. As we neared the famous Hotel Indonesia roundabout, the road became so chock solid that I was forced into my usual foolhardy tactic of wheeling my iron horse into the Busway lane and then pumping the old thighs hard enough to avoid being steamrollered into the asphalt by a pursuing TransJakarta behemoth. None of my fellow cyclists proved to be up to the Busway challenge however. The big Jessies. Up at Monas, the lights went out, plunging the flame tipped phallus into darkness, well, semidarkness anyway. A real Earth Hour, in my view, would kill street lights, traffic lights, hospital defibrillators, respirators and dialysis machines, the lot. Let's see how committed people actually are to this premise. For my part, I gave up after half an hour and went to soak up the native charm down on nearby Jl. Jaksa at a friend's birthday drinkathon. Earth Hour ay? I can't help feeling that this charity for the environment isn’t raising consciousness to the critical level of visceral, physical reality needed to break the capitalist-consumerist fantasies of our lives, lives that increasingly float unshackled by mere Earthly, environmental gravity, lives that are buoyed up by images on screens and the disembodying effects of surfing the net. Rather the whole environmental, Earth Hour shtick seems to have been assimilated into our materialistic culture as just another ad campaign. As the novelist Christopher Isherwood once said, the rich world has, "retired to live inside our own advertisements. Like hermits going into caves to contemplate." Earth Hour is just another excuse to break out the bumper stickers and have a feel good Kodak moment, whilst the underlying mismatch of a capitalist system predicated on infinite expandability existing in a world of finite resources is never addressed. Like the shark that needs to keep swimming to prevent itself from sinking to the bottom, our capital centric world has to keep growing to work properly. Thus new desires and needs have to be constantly manufactured. You can look in the wardrobe and think to yourself, “Right I’ve got eight shirts, one for everyday of the week, and one more for luck” but who does? Nobody in the developed world does this because that’s no good for the system. 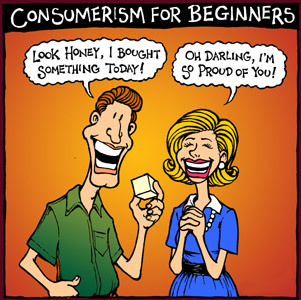 The system has to get you to keep buying more and more shirts in order for the whole game to work, and thus a whole mindset, an ethos of consumerism, has to be instilled in the subject. Such an ethos cannot simply be shrugged off by turning off the lights for an hour, lighting a few candles and singing a few choruses of MJ’s “Heal the World”. Drunken musings aside, after a good old session with my friends, I found myself strolling outside of our bar of choice. "Oh bugger, I brought the bike didn't I?" I mused to myself. Now, I cycle to work every day, which is only 15 minutes from my house, but I'm certainly not used to cycling to the boozer of an evening. Moreover, earlier in the night, a friend had confessed to cycling into a metal pole in the middle of the street after a particularly discombobulating night out in Bali. "I mean, what was the pole doing there?" He implored. "Don't blame the pole," I reasoned, "it's only one short step from that to 'These are my airline seats, I'm a very important man, I'm friends with the boss of your company, I could have you fired!'" In any case, it was time to man up and wobble off home. Thankfully my bicycle has brakes, otherwise I'd have really been trouble.